Space + sports = fun. Yes, I am a former math teacher, and I remember what adds up to engaged learning — start with two subjects that most students enjoy. Hypothesis: Combining the wonder of space and NASA with the thrill of sports will motivate students for greater learning success. And now the science teacher in me comes out. Whether you take the mathematical approach or use the scientific method, NASA’s Spaced Out Sports design challenge can get the ball rolling. Okay, I’ll stop. Students design a game for astronauts to play on the space station. Students apply Newton’s Laws of Motion to design or redesign a game that astronauts on the International Space Station can play. The competition is open to students in grades 5-8. Student teams will submit game demonstrations via a playbook and a video. Submissions will be accepted from schools, home school groups, and after-school or enrichment programs. Watch the video of last year’s winners. Use the DIY Podcast videos to jump-start students’ ideas and to find background information about Newton’s laws and microgravity. 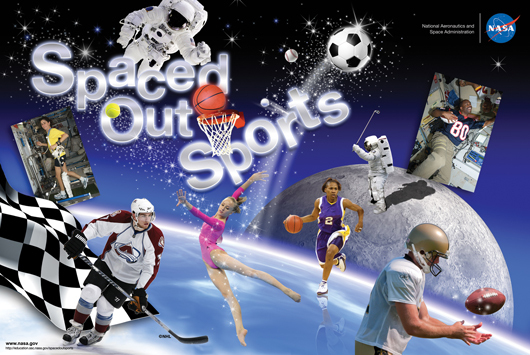 The deadline for Spaced Out Sports submissions is March 16, 2012. For details, visit the Spaced Out Sports website. Teachers, let the games begin! Please Note: If you leave a comment, please do not include a link to your blog or other websites. We typically won’t be able to approve your comment if you add a URL.